MODERATE avalanche danger continues with a persistent slab avalanche problem at all elevations. Large and destructive avalanches are still a concern throughout the forecast region. Avalanche danger is expected to further rise over the next few days. Uncertainty continues to exist with this persistent weak layer that is buried 2 to 4' deep in the snowpack. The last known avalanche that occurred on this weak layer was on Friday Jan 11. Snowpack tests have mostly trended towards the layer gaining strength, but some tests continue to show that propagation is likely if the weak layer can be initiated. The last avalanche occurred in complex terrain triggered by a large cornice failure. While the likelihood of triggering a persistent slab avalanche may be low, the consequences of a large destructive avalanche are high. Talk with your group about managing terrain. Avoid areas where large cornices exist above complex terrain. * Observations came in yesterday from Upper Coldstream Canyon and Donner Peak (Donner Summit area), Needle Peak (Pole Creek area), Becker Peak (Echo Pass area), and DK's Canyon (East Shore area). All of these locations were able to find the old buried facet layer. Snowpack test results varied by location, with some continuing to produce propagation results with the ECT and PST. Large surface hoar was seen in most areas. * Large massive cornices exist in many near and above treeline areas throughout the forecast region. Mostly cloudy conditions today with a slight chance of light snow through the afternoon and overnight. Up to 2'' of new snow is expected by Tuesday morning with light to moderate SE winds. Tuesday will bring the chance for additional light snow amounts and increasing winds. The main storm on Wednesday afternoon through Thursday still has the possibility to bring feet of snow to the Sierra. 0600 temperature: 16 to 19 deg. F.
Weather: Mostly cloudy. Slight chance of snow in the afternoon. Snow levels below 7000 feet. Chance of precipitation is 15%. Cloudy. Chance of snow. Snow levels below 7000 feet. Chance of precipitation is 50%. Cloudy. Snow likely. 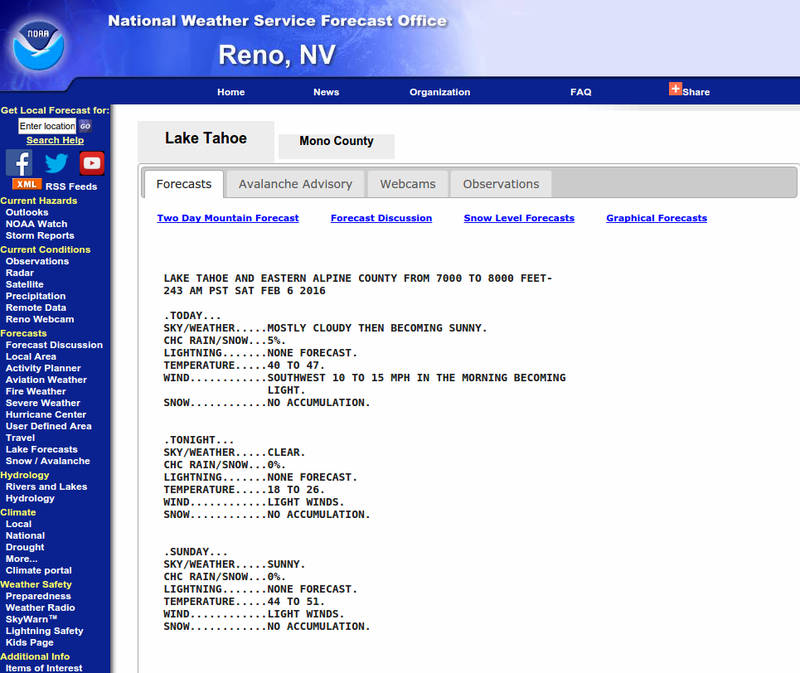 Snow levels below 7000 feet. Chance of precipitation is 70%. Temperatures: 28 to 34. deg. F. 20 to 25. deg. F. 30 to 35. deg. F.
Mid Slope Winds: East winds 10 to 15 mph. Gusts up to 25 mph in the afternoon. Southeast 10 to 15 mph with gusts up to 25 mph. South 10 to 15 mph with gusts to 25 mph. Expected snowfall: Little or no accumulation. | SWE = trace amounts. 80% probability up to 1 inch. 20% probability of 1 to 3 inches. | SWE = less than 0.15 inch. 70% probability of 1 to 3 inches. 30% probability of 3 to 5 inches. | SWE = up to 0.20 inch. Weather: Mostly cloudy. Slight chance of snow in the afternoon. Snow levels below 7000 feet. Chance of precipitation is 15%. Cloudy. Chance of snow. Snow levels below 7000 feet. Chance of precipitation is 50%. Cloudy. Snow likely. Snow levels below 7000 feet. Chance of precipitation is 75%. Temperatures: 22 to 28. deg. F. 18 to 23. deg. F. 24 to 30. deg. F.
Ridge Top Winds: East 15 to 30 mph with gusts to 45 mph. Southeast 15 to 25 mph with gusts to 40 mph. South 15 to 30 mph. Gusts up to 45 mph increasing to 55 mph in the afternoon. Expected snowfall: Little or no accumulation. | SWE = trace amounts. 80% probability up to 2 inches. 20% probability of 2 to 4 inches. | SWE = less than 0.20 inch. 70% probability of 2 to 4 inches. 30% probability of 4 to 6 inches. | SWE = up to 0.30 inch.